The details of how universities, research institutes and libraries acquire subscription electronic resources vary considerably between countries. But in most cases they share an important feature in common; the money may flow through the system in different ways, but it starts from the government. This leads governments to focus on a number of issues in the system. Some publishers promised to provide PCA themselves, providing access to paid-for content without further payment, but librarians were rightly skeptical of these unfunded promises. The enthusiasm for open access led HighWire Press to pioneer and some publishers to adopt the moving wall concept. Because the value of content decays through time, providing open access to content older than, for example, 12 months does little to reduce the motivation for libraries to subscribe, while rendering PCA less of an issue. Several efforts took place to establish e-journal archives, in order that PCA not be at the whim of the publisher. I posted a historical overview of e-journal archiving to my blog back in 2011. It is becoming clear that the sweet spot for providing PCA is at a national level, matching the source of most of the subscription funds. A global third-party archive such as ITHAKA's Portico poses essentially the same problem as the original publishers do, access is contingent on continued subscription payment. National archives match national publisher licensing, and are large enough to operate efficiently. The Internet that connects readers to publishers' Web sites is a best-efforts network passing through many links and routers on the way. There are no guarantees that requested content will be delivered completely, or at all. The LOCKSS system's crawlers constantly detect complete or partial failure to deliver content. These could be caused by errors at the publisher, or along the network path to the crawler. Experience suggests that the fewer hops along the route the fewer errors, so at least some errors are network problems. The ability to fail over from the publisher to a National Hosting Network (NHN), which is closer to the readers, and operates independently of the publisher, can significantly enhance the availability of the content. For most countries, the publishers of the vast majority of the content to which they subscribe are located in, or have substantial business interests in, the USA. Interestingly, the USA has long had a National Hosting program. Los Alamos National Labs collects all e-journals Federal researchers could access and re-hosts them. The goal is to ensure that details of what their researchers, possibly working on classified projects, look at is not visible outside the Federal government. Edward Snowden's revelations make it clear that the NSA and GCHQ devote massive efforts to ensuring that they can capture Internet traffic, especially traffic that crosses national borders. This includes traffic to e-journal publishers. Details of almost everything your national researchers look at is visible to US and UK authorities, who are not above using this access for commercial advantage. And, of course, many academic publishers are based, or have much of their infrastructure, in the US or the UK, so they can be compelled to turn over access information even if the traffic is encrypted. An even greater concern is that the recent legal battle between the US Dept. of Justice and Microsoft over access to e-mails stored on a server in Ireland has made it clear that the US is determined to establish that content under the control of a company with a substantial connection to the USA be subject to US jurisdiction irrespective of where the content is stored. The EU has also passed laws claiming extra-territorial jurisdiction over data, so is in a poor position to object to US claims. Note that software is also data in this context. Thus the access rights notionally conveyed by subscription agreements are actually subject to a complex, opaque and evolving legal framework to which the subscriber, and indeed the government footing the bill, are not parties. The US is claiming the unilateral right to terminate access to content held anywhere by any organization with significant business in the US. This clearly includes all major e-journal publishers, such as EBSCO, Elsevier, Wiley, Taylor & Francis, Nature, AAAS and JSTOR. As governments, and thus taxpayers, are the ultimate source of most of the approximately €7.6B/yr spent on academic publishing, concern for the value obtained in return is natural. Many countries, such as the UK, negotiate nationally with publishers. Institutions obtain access by opting-in to the national license terms and paying the publisher. The institution can obtain COUNTER usage statistics from the publisher, so can determine its local cost per usage. But the opt-in license and direct institution-to-publisher interaction make it difficult to aggregate this information at a national level. Governments also fund most of the research that appears in smaller, locally published open-access journals. Much of this is, for content or language reasons, of little interest outside the country of origin. It is thus unlikely to be preserved unless NHNs, such as Brazil's Cariniana, take on the task. What Does National Hosting Need To Do? A database (the entitlement registry) tracking the content to which, at any given time, each institution subscribes. A system for collecting and preserving for future use the content to which any institution subscribes. A system for delivering content to readers that they cannot access from the publisher. A number of countries are at various stages of implementing NHNs using the LOCKSS technology to satisfy these requirements. How Does LOCKSS Implement National Hosting? The LOCKSS Program at the Stanford Libraries started in 1998. It was the first to demonstrate practical technology for e-journal archiving, the first to enter production, and the first to achieve economic sustainability without grant funding (in 2007). The basic idea was to restore libraries' ability to purchase rather than lease content, by building technology that worked for the Web as the stacks worked for paper. Detect and correct any content that a box failed to collect completely. Detect and repair any damage to content over time. Most publishers allowed libraries to use LOCKSS but, for various reasons some of the large publishers were not happy with this model. They took the initiative to set up the CLOCKSS archive, which uses the same technology to implement a dark archive holding each publisher's total output in a network of currently 12 boxes around the world. A National Hosting Network would be similar, but with perhaps half as many boxes. A network of 4 LOCKSS boxes harvests content from publishers' Web sites and collaborates to detect and correct collection failures. Some publishers supply content via file transfer to a machine which adds metadata and packages it. The LOCKSS daemon software on each of the 12 production boxes then collects both kinds of content from the ingest machines by crawling them, under control of the appropriate plugin. Subject to publisher agreement, the same ingest technology can be used to ingest content into NHNs. This would satisfy requirement #2 above. Requirement #1, setting up an entitlement registry, involves setting up a database of quads [Institution, Journal ID, start date, end date]. The UK's SafeNet project has done so, and is working to populate it with subscription information. They have defined an API to this database. Countries that already have a suitable database can implement this API, countries that don't can use the UK's open-source implementation. The LOCKSS software is being enhanced to query the entitlement registry via this API before supplying content to readers, thus satisfying requirement #3 above. Readers can access the content via their institution's OpenURL resolver, or via a national DOI resolver. This diagram shows the configuration of the ingest and preservation aspects of a typical Private LOCKSS Network (PLN). This one has a configuration server controlling a network of 6 LOCKSS boxes, each collecting its content from a content source, and communicating with the other boxes to detect and correct any missing or damaged content. 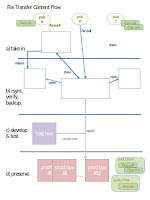 LOCKSS-based NHNs are a type of PLN, and typically would look exactly like the diagram, with 6 or more boxes scattered around the country managed by a central configuration server. Just as with the CLOCKSS Archive, some content for an NHN would be available via harvest, and some via file transfer. 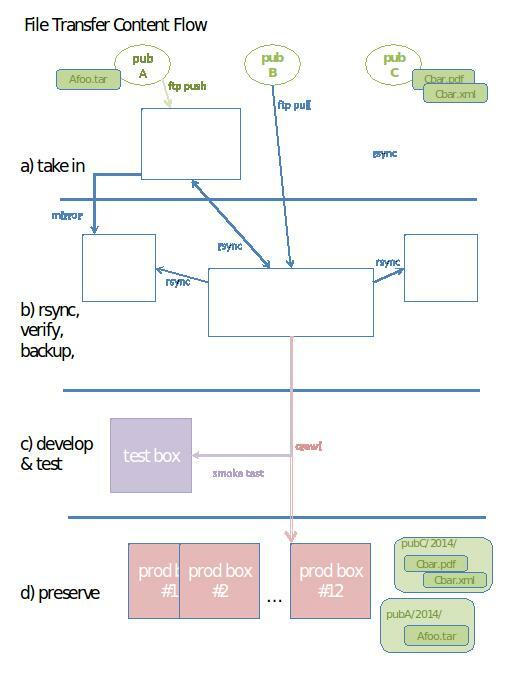 The file transfer ingest pipeline for CLOCKSS is shown in this diagram, the pipeline for an NHN would be similar. For security reasons, content that the publisher uploads to a CLOCKSS FTP server goes to an isolated machine for that purpose only, and is then downloaded from it to the main ingest machine via rsync. Content that publishers make available on their FTP servers, or via rsync, is downloaded to the main ingest machine directly. Two backup copies, one on-site and one off-site are maintained via rsync to ensure that the content is safe while in transit to the production LOCKSS boxes. The CLOCKSS archive ingests harvest content using a separate ingest network of 4 machines which crawl the publishers' sites, and are then crawled by the 12 production CLOCKSS boxes. The boxes in an NHN would typically harvest content directly, by crawling the publishers' sites, so an ingest network would not be needed. The CLOCKSS Archive is dark; the content in production CLOCKSS boxes is never accessed by readers. If content is ever triggered, the CLOCKSS team executes a trigger process to copy content out of the network to a set of triggered content servers, which make it openly accessible. NHNs need to make their content accessible only to authorized users, so they need an access path similar to that for LOCKSS. It must consult the entitlement registry to determine whether the requested content was covered by the requester's institutional subscription. By acting as an HTTP proxy, in which case the reader whose browser is proxied via their institution's LOCKSS box will access the content at the publisher's URL but, if the publisher does not supply the content, it will be supplied by the LOCKSS box. By resolving OpenURL queries, using either the LOCKSS daemon's internal resolver, or an institutional resolver such as SFX. LOCKSS boxes can output KBART reports detailing their holdings, which can be input to an institutional resolver. The LOCKSS box will then appear as a alternate source for the resolved content. Access will be at a URL pointing to the LOCKSS box. By resolving DOI queries, using the LOCKSS daemon's internal resolver. Access will be at a URL pointing to the LOCKSS box. In each case, the LOCKSS box is configured by default to forward the request to the publisher's Web site and supply content only if the publisher does not. Methods 1 & 2 rely on knowing the original publisher's URL for the content. For file transfer content, this is generally not available, so the method 3 or 4 must be used. The format in which a publisher supplies file transfer content varies, but it generally includes metadata sufficient to resolve OpenURL or DOI queries, and a PDF that can be returned as a result. "Intercloud’s security architecture is also in line with strict German and European data privacy laws and in compliance with the highest standards. Now that the European Court of Justice has declared the Safe Harbor Agreement between Europe and the US null and void, DSI Intercloud by Cisco and T-Systems is the secure German IaaS service from the cloud." Europeans should sit up and take more notice of Microsoft’s lawsuit against the US government over secret access to their data. Why? Because it affects much more of their data than the Safe Harbour case, according to Microsoft president and lead counsel Brad Smith. Smith said 90 per cent of Europeans' data is affected by the Irish warrant case; far more data than is affected by the transatlantic flows governed by safe harbour rules, which Austrian Max Schrems exploded in a European court ruling last year. "I’ve been trying to explain, even to civil liberties supporters, why the current 2-degree targeted dragnet is still too invasive of privacy. We’ve been having this discussion for 2.5 years, and yet still most people don’t care that completely innocent people 2 degrees — 3, until 2014 — away from someone the government has a traffic-stop level of suspicion over will be subjected to the NSA’s “full analytic tradecraft.”"
and (b) they need a way to recover if the selection process failed by getting it from someone who has stored it, in this case Microsoft in Ireland. Andrew Orlowski at The Register has an interview with John Frank, Microsoft's legal strategist for the case of the Dublin e-mails. Add Portico to the list of sites suffering outages; it was experiencing some technical problems this morning. OUP is down again today. For the second time in the last few months the UK's JANET academic network was DDOS-ed meaning that for 5 days access to journals was problematic if they were hosted outside the UK. "United States Court of Appeals for the Second Circuit reversed a lower court’s ruling that Microsoft must turn over email communications for a suspect in a narcotics investigation stored in a Microsoft data center in Dublin." "that Microsoft’s status as a company based in the United States gave it authority to obtain its data, even if the data was stored outside the country." "The government is likely to appeal the ruling, legal experts said." Not just appeal, but also propose legislation to overturn the court's decision. "Federal prosecutors in New York late Thursday asked a federal appeals court to reconsider its July decision that allowed Microsoft to successfully claim that authorities had no legal right to access data stored on its servers outside the country, even with a warrant from a federal judge. A three-judge panel of the 2nd US Circuit Court of Appeals had ruled that federal law, notably the Stored Communications Act, allows US authorities to seize content in US-based servers, but not in overseas servers—in this case, Dublin, Ireland." "An evenly split federal appeals court ruled Tuesday that it won't revisit its July decision that allowed Microsoft to squash a US court warrant for e-mail stored on its servers in Dublin, Ireland. The 4-4 vote by the 2nd US Circuit Court of Appeals sets the stage for a potential Supreme Court showdown over the US government's demands that it be able to reach into the world's servers with the assistance of the tech sector." "A federal magistrate judge handed down an opinion this afternoon, In re Search Warrant No. 16-960-M-01 to Google, ordering Google to comply with a search warrant to produce foreign-stored emails. The magistrate judge disagrees with the U.S. Court of Appeals for the 2nd Circuit’s Microsoft Ireland warrant case, recently denied rehearing by an evenly divided court. Although the new decision is only a single opinion by a single magistrate judge, the decision shows that the Justice Department is asking judges outside the Second Circuit to reject the Second Circuit’s ruling — and that at least one judge has agreed." More details of the magistrate judge's ruling and how the case differs from Microsoft's from Tim Cushing at TechDirt. "The DPC's complaint ... relates to the US National Security Agency's en-masse pilfering of data held by American corporations on EU citizens. This led to the collapse of the Safe Harbor agreement, which allowed American businesses to affirm they were upholding European privacy laws even outside of Europe, after a European Court of Justice ruling in favour of Austrian lawyer Max Schrems in 2015. A replacement agreement was quickly assembled and dubbed Privacy Shield to the outrage of critics, but during the interim Schrems had complained that companies such as Facebook were continuing to shuffle data westwards using "model contracts" or "standard contractual clauses", which Facebook, Microsoft, and Salesforce claimed allowed customers to practically ignore the judgment. "Microsoft is clear to sue the US government for gagging the company from telling users when their data has been accessed by the State. The lawsuit, filed last April, jumped another legal hurdle this week, ... It's Microsoft's fourth legal broadside against the US government on data protection rights for users of cloud services. Microsoft argues that the laws purportedly protecting customers privacy are now outdated and ineffective, and need to be modernised if the public is to trust the cloud." "In a series of amicus briefs, corporations including Microsoft, Apple, ... Yahoo!, Amazon and Cisco wrote to complain about the February ruling in the Google case." "Google has been ordered by a US court to cough up people's private Gmail messages stored overseas – because if that information can be viewed stateside, it is subject to American search warrants, apparently. During a hearing on Wednesday in California, magistrate judge Laurel Beeler rejected [PDF] the advertising giant's objections to a US government search warrant seeking data stored on its foreign servers. The Mountain View goliath had filed a motion to quash the warrant, and was denied." More detail on Google and other companies push back against extra-territorial warrant is behind Forbes' annoying ad-block defenses. A company that has been caught supplying malvertising should be less arrogant. "Some 345 Datalink webpages have been de-indexed from Google's Canadian site, per various Canadian court orders. But a court in British Columbia issued a broader order, insisting that Google stop listing Datalink's entire website anywhere in the world. Today, Canada's Supreme Court upheld that order." "What the DOJ doesn't seem to understand (or genuinely just doesn't care about) is a decision granting it the power to seize communications from anywhere in the world would result in foreign governments expecting the same treatment when requesting communications stored in the US." A federal judge has upheld the maguistrate judge's order requiring Google to hand over data from servers overseas. More from David Kravets on the Google vs. DoJ warrant fight. "Unfortunately, a core component in one of our data centres became unresponsive, which brought down a large part of our infrastructure. Our teams have worked around the clock in multiple time zones to restore systems and services and, as a result, most of our sites are now functioning as normal." "The Supreme Court on Monday agreed to decide whether law enforcement authorities, armed with a valid search warrant from a federal judge, can demand that the US tech sector hand over data that is stored on overseas servers. In this case, which is now one of the biggest privacy cases on the high court's docket, the justices will review a lower court's ruling that US warrants don't apply to data housed on foreign servers, in this instance, a Microsoft server in Ireland." "Microsoft should not be able to “shield evidence” held on Irish servers from US prosecutors, a group of 35 US state attorneys general has argued. "this was not an optimal experience for libraries and their users"
"Tech giants including Microsoft, Google and Apple have given a proposed US law on overseas data sharing the thumbs-up. "These include a motion to quash or modify the legal process if it believes the customer isn't a US citizen and that disclosure "creates a material risk" that the firm would violate the laws of another government." But if it passes it does clarify that the basic position is that data in the custody of companies with significant business in the US is subject to the whims of the US government. The EFF analyses the CLOUD act and points out its many troubling implications. "Supreme Court justices on Tuesday wrestled with Microsoft Corp’s dispute with the U.S. Justice Department over whether prosecutors can force technology companies to hand over data stored overseas, with some signaling support for the government and others urging Congress to pass a law to resolve the issue." reports Reuters. Tim Cushing's Supreme Court Hears Oral Arguments In Microsoft Email Case reports in some detail on the arguments. Bloomberg reports that the EU is just starting to come to terms with the implications of the US CLOUD act.